The portion marked No. 85 in the picture was a separate house (No. 39 in 1850), leased by John Delany from Eyre Evans who lived in Garryvacum, near Ballybrittas. John Delany was succeeded by the Craven family one of whom, Edward was a well-known builder in the town1. Interestingly, the immediate lessor of the adjoining house - which dates from the 1840's - was none other than the abovementioned John Delany. His lessees were Edward Hannigan - a provision dealer mentioned in an 1856 directory - and Mary Hannigan, followed by John and Julia Ryan. In the 1880s, both houses were acquired by Thomas Grattan, a widower who resided and ran the Leinster Boot Company here. One of his daughters, Katie, was a milliner; the other, Sarah, a draper's assistant. His son, twenty-year-old Thomas Henry, is listed as manager of the family business (which, according to a local newspaper in 1901, still maintains its record for good goods at fair prices). On Census Night, 1911, Thomas, Thomas Henry and Sarah (now listed as housekeeper) were still here, joined by three shop assistants from various parts of the country and one domestic servant. Following Thomas Grattan's death, the business and dwelling were put up for sale in April 1923 and subsequently became Michael Nolan's Ladies and Gent's Outfitter and Boot warehouse which, in the 1940's, also had branches in Athy, Mountrath and Abbeyleix. 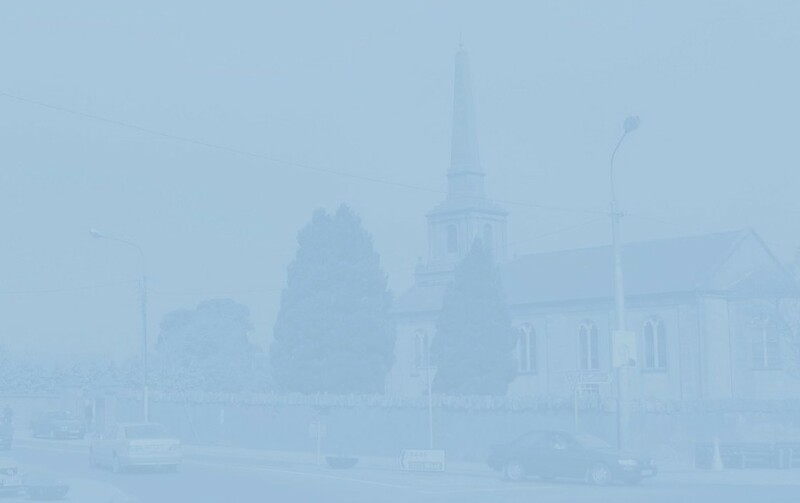 Nolan's was succeeded by Thomas Robinson's Reliable Clothing Company (which relocated here from further up Main Street) and, in 1969, it was bought by Alan Flynn from Baltinglass. [Like the Dimond family from next door fifty years before them, the Robinsons also emigrated 'Down Under']. 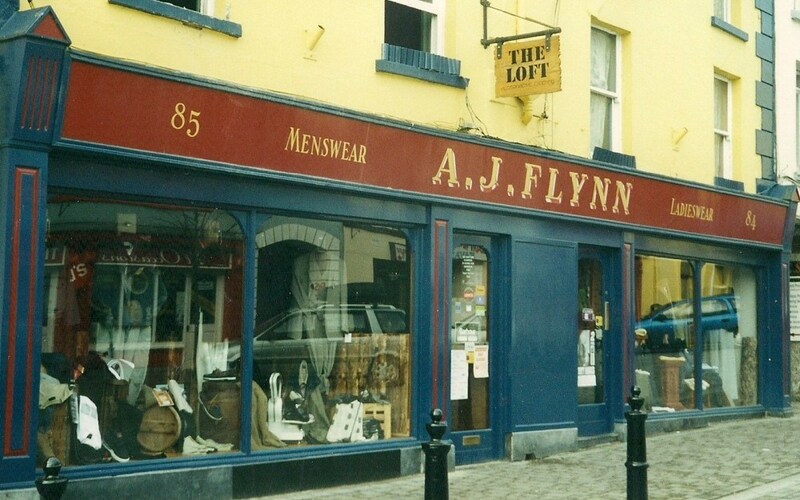 According to a shopping guide from the 1980's, A. J. Flynn's brought to a provincial town such as Portlaoise the fashions and trends of the metropolis! By 1926, the No. 84 portion was the Leinster Stores owned by James Fitzgibbon, grocer and general merchant (Best Goods at Lowest prices). He was a native of County Cork and his wife Bridget Lynch from Straboe. In the early 1960's, after their heroic exploits on the pitch, it was in Fitzgibbon's Grocery and Cafe (The Home of Good Food) that victorious Christian Brothers teams tore into glasses of orange and mounds of sausages and chips. As seventh sub of seven - an act of charity on the Rev. Brother's part - I was always grateful to be included in such munificence. On one occasion, at an U-12's match in Portarlington, I failed to make even the subs' bench (i.e. the huddle of young lads shivering on the sideline) but, to compensate, the beneficent Brother conferred on me the dubious honour (Seo job an-thábhtach, a Sheáin) of distributing halves of oranges at half-time. He even trusted me with a knife. In more recent times, No. 84 housed both Revolution for Kids and Designer Kidz. After lying vacant for three years, it became Christmas Wonderland - run by Breslin's Chemists - in 2014 and, in May 2015, Euphoria, selling MMA (Mixed Martial Arts) accessories, clothes and supplements. Three years later, Martin's Barber Shop relocated here from Church Avenue. 1 He built Maryville (1861), the fine white house behind the CBS and clearly visible from Railway Street. Situated in the area formerly known as the Golden Croft - it was once the residence of the town's Parish Priests and later, the curates. Following their departure, it became the home of retired Christian Brothers, but, today (2016), it lies vacant and completely boarded-up. A dreadful waste of a lovely house. It appears that Edward Craven was also Secretary of the Town Commission in 1858. A directory from 1870, incidentally, lists him - or his relation/namesake - as a grocer and publican. Thirty years earlier, a William Craven - his father? - was listed in the same profession.